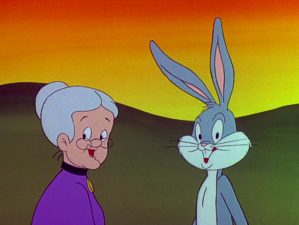 With the Easter Bunny under the weather, Granny visits Bugs to see who might be able to carry out his basket delivering duties. Cartoons have always been a staple of television programming. It was a Mickey Mouse cartoon that was interrupted on British TV when World War II broke out and screens went dark (only for it to be the first program played – with the end intact – when the War was finally over) and when television took hold in the United State in the 1950s, the theatrical shorts of the 30s and 40s were popular filler until original, limited animation programming began to be created in the 1950s. A cheaper alternative was to mix the two, and in the 1960s the failing Warner Bros. Animation unit just about kept afloat by producing new interstitials between the animated shorts of the Studio’s golden age, for compilations named after their famed stable of characters. 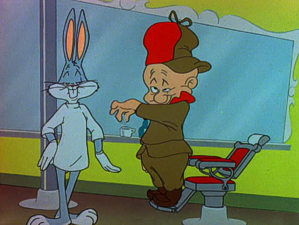 By the 1970s, there was a resurgence in interest in those original cartoons, a great deal of it fuelled by the feature documentary Bugs Bunny Superstar, and Warners were quick to respond with a new series of specials that combined classic material and new linking scenes that attempted to provide a coherent theme to the program. 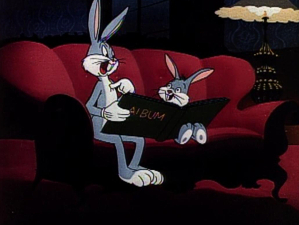 Although the Warners characters had been used in this way since The Bugs Bunny Show in the 1960s, the popularity of these half-hour programs led to Friz Freleng suggesting the later feature compilations such as The Looney, Looney, Looney Bugs Bunny Movie and The Bugs Bunny/Road Runner Movie. For me, this was the way I experienced many of the Looney Tunes cartoons for the first time, and I used to devotedly tape these shows whenever they turned up on TV. 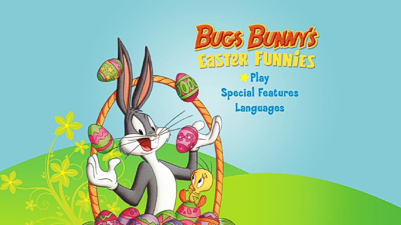 Some were hit and miss, while others actually proved to be pretty clever ways to bring together themed cartoons (I’ll always have a soft spot for The Dukes Of Hazzard’s Denver Pyle hosting a wild west collection of Bugs and Daffy’s best gunslinging cartoons), and this Easter special from 1977 is one of the best of the bunch. 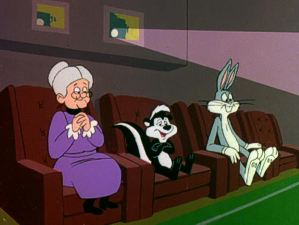 Until Chuck Jones returned to reclaim some kind of part ownership over the Looney Tunes, previous animation unit co-director Freleng was the self-appointed guardian of the characters, and took it upon himself to supervise these shows, produced under the aegis of his partnership with David DePatie. Although the classic characters had never really been missing from our television screens, these assorted specials secret weapon were the new interstitial material and the way they regurgitated versions of the original cartoons, usually re-cut and re-voiced to emphasize the intention of the new plot. Sometimes these worked, but more often than not, long-time fans will easily pick up on the differences between Mel Blanc’s characterizations of the 40s and 50s, and his lower-pitched approximations of the 1970s, the period when his Daffy and Sylvester were virtually indistinguishable. Blanc’s impersonations can be excused in the long run – it’s not as if the animation is a perfect blend between the Warners unit and DePatie/Freleng’s sometimes too simple redrawings – but even as a kid I noticed the differences, even if I didn’t quite catch what was going on at the time, and more perceptible was Blanc’s softened exuberance, almost blanketed under the weight of time. 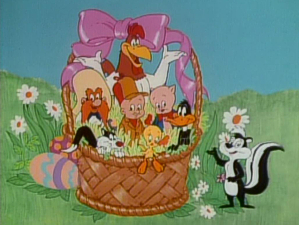 But that all said, these are still the same characters and, even if the characters aren’t as sprightly as we remember them vocally, shows such as these are valid examples of the Looney Tunes legacy, and the writing is still funny stuff; it’s somewhat ironic that Warners have timed the release of Rankin/Bass’ The First Easter Rabbit as a concurrent release, since the rabbit that phones in sick here is clearly a reference to that special from the year before, either as an homage or an intended, outright lampoon that well recalls the spoof nature of the classic Looney Tunes, perhaps in part due to another Studio veteran, Bob McKimson, coming back on board to direct some of the new material, and June Foray enjoying a rare screen credit as Granny. 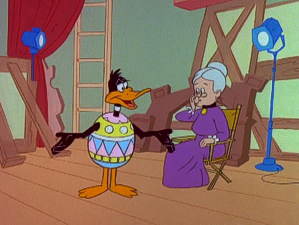 There’s also something of an art into how cartoons such as Knighty Knight Bugs, Hillbilly Hare, Birds Anonymous, Rabbit Of Seville and Robin Hood Daffy, among others, are weaved in and out, even if none of them have anything remotely to do with Easter and the major cheat of having the characters seen “at work” at the film studio makes these things easier to accomplish. With Bugs Bunny’s Cupid Capers also making a debut on DVD this year, I’m hoping that Warners are finding a way to bring these specials to disc, and even if I really wish they’d provide more content on a single patter, I’m looking forward to the likes of seeing that How Bugs Bunny Won The West program again, or Daffy Duck’s Thanks-For-NOT-Giving special, for instance, and finally be able to retire my taped collections of old. Without any bells or whistles, the biggest grumble here is that Warners should really be putting out these shows in larger chunks of content on disc. 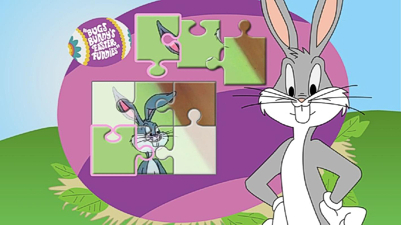 Although Bugs Bunny’s Easter Funnies is double length at 50 minutes, there’s still plenty of these programs to make up a series of much better value two-hour discs. On this occasion, we’re offered a single extra short, His Hare Raising Tale, from 1951, which assumedly is in here because it’s another compilation (albeit one from the theatrical days). This was one of the Warners shorts that I owned back in the days of Super 8 home movies, and the sad news here is that the Studio hasn’t used any kind of remastered edition for this disc and, indeed, I’m quite sure my Super 8 print is still probably in much better condition than that seen here, which makes its inclusion a frill without any substance. There’s also a meagre Easter basket of Three Menu-Based Puzzles For Kids, none of which are particularly exciting (even for kids) or come with any kind of gameplay explanations, but hopefully, Warners will make more of the additional Looney Tunes cartoons in their library than just putting out basic discs like these, which won’t really entice long-time fans or result in decent sales for the company. There’s still much material once destined for the Golden Collections that could be spread about on titles such as these, which wouldn’t require the Studio to splash out on new features, but would give fans a reason to continue collecting. Previews for Scooby-Doo: Abracadabra-Doo and the Peanuts Valentines/Easter specials are also to be found, though I couldn’t spot any additional (and much needed) Easter Eggs! A basic disc treatment gets a basic cover deal, too, and this isn’t really anything more than it needs to be: a decent sleeve that lists the title and contents with adequate style. If there’s one thing that can usually be counted on with a Warners disc, it’s that whatever the age or source, they’ll do their best in the audio and video departments. Although there’s no emphasizing of any remastering, it’s clear this transfer has come from a fresh print…after a brief but pretty smudged opening title, it’s a lot better than the one I taped off-air, and certainly crisper than anyone would have seen it back in the 1970s. Light grain and speckling are to be expected, but not predominant, the colors are rock steady, and the classic sequences are in much better than anticipated condition. Although Blanc and Foray’s vocals are softer, and the music more about simply providing incidental orchestration rather than underscoring specific moments in the new scenes, there’s a genuine push to try and match the energy of the classic cartoons, which sound great. A lack of any background noise makes sure everything sounds as direct as possible, and for a television mono mix, there’s nothing to really pick apart. A Spanish dub is also included, as are English, French and Spanish subtitles. 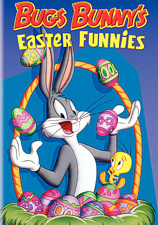 Unlike the concurrent WB Easter cartoon release of Rankin/Bass The First Easter Rabbit, an expensive 25 minutes at $15, Bugs Bunny’s Easter Funnies at least offers up “new” material interspersed with the classic cartoon excerpts and double the running time, for a price that is largely going for around an extremely reasonable $10 online. The 1970s television specials may not have been the most frivolous of Looney Tunes fare, but they were still created by the old masters and contain the odd gem scattered in among other memorable moments. 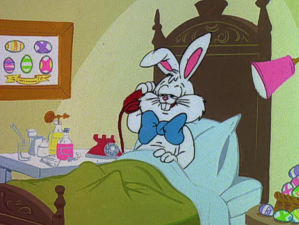 They certainly kept me entertained as a child, and now as an adult collector I may see the stitching between the old and new, but Bugs Bunny’s Easter Funnies is still a nice slice of old-school Looney Tunes fun.